The scenery behind it has changed, but the street sign we put up at the newspaper years ago is still there. Cushman was a newspaperman for 40 years and the publisher of the Albany daily from 1968 until 1988 or a year or two later. I’m hazy on the year he retired, and his obituary in the Bend Bulletin was brief, which was typical of the man it described, and didn’t give that date. His achievements were many, though. Chief among them was reviving the Albany paper and, before my time, with the help of people like executive editor John Buchner and circulation manager Syl Feil, turning it into a vigorous paper with a growing readership and a strong local voice. Also, though, he expanded the Democrat-Herald Company for its owner, Glenn Jackson, by adding other papers in Lebanon, Ashland, Gresham, Cottage Grove, Springfield and Newport, as well as other places in Washington and other states. He then managed this far-ranging operation when it was bought by Capital Cities Inc., a broadcast and newspaper company with a national presence. After Cushman retired, this array of publications was pretty much dismantled or spun off under subsequent owners, first The Disney Co. for a while and then Lee Enterprises, which still owns the papers in Albany and Corvallis. Glenn came back for a visit to Albany when we opened the remodeled Democrat-Herald building in about 1994. In think it was on that occasion when, to pay our respects, we put up a street sign with his name on it in the parking lot. 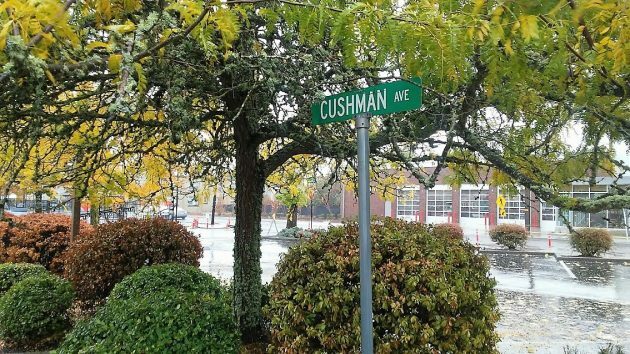 In the rain on Saturday, I checked and was glad to see that “Cushman Avenue” is still there. You’re still succeeding, Hasso. Admirably. Sorry for your loss. Thanks to him, and to you for “Trying to make things better”. Your community involvement is greatly appreciated. Hasso–when you left, did you instruct those who followed you with the same advice?? That is why we went to the digital on-line edition of the Democrate-Herald. . Extremely poor home delivery for a number of years. I really like to hold the paper copy in my hands and read, but we are having to settle for on-line now. Reality of modern times. Both Cushman and Hering did a good job managing a small town publication under tight economic conditions. Unfortunately, as one moves forward in time on the Cushman/Hering Career Continuum, the final leg in the newspaper’s journey to the Customer – the home delivery – continues to grow worse and worse even as the newspaper’s price rises. The paper tossed onto wet boulevard grass, not even making it to the lawn. The paper pitched into the wrong driveway day after day. The paper flung haphazardly, landing under low-hanging branches, nearly impossible to see. Certainly Mr. Cushman and Mr. Hering are to be commended for their Editorial integrity and Marketing acumen. Perhaps the brazen mistreatment of paying consumers is simply a function of the Democrat-Herald having been swallowed up by an uncaring publishing behemoth. Local News sources are critical in a functioning democracy. Customers happy to pay for for it should not have to walk out into a downpour to pick that soggy Local News off the yard. Mr. Hering, it is through your good efforts that I paid any attention to the paper, at all. I appreciated your work then, and I follow you still. I am no Facebooker and leave Twittering to the birds, who are much better at it than we will ever be. But to he assured of hearing a familiar voice in my community, day after day…now that is worth writing about. Like Mr. Hartman, I, too, have been treated shabbily as a paying customer. And having delivered the D-H from my bike as a 7th grader, and knowing the prices on the ticket book, and getting an occasional cookie or dollar as my tip, I know the avaricious nature of price increases while service declines. It is a bitter pill. Makes it worth it to know about our community. I, too, still like holding the paper and reading. Always will.